Greetings Annarino’s Martial Thoughts Blog Readers to the first of what I hope to be many articles in 2019! My goal for 2019 is to publish something on a monthly basis for your reading pleasure. That being said lets dive right in to this month’s subject, Training Mind As Well As Body! For those of you that train regularly with me at Annarino’s Martial Arts you know that I am often referred to as “Librarian Sensei”. That title has been humbly bestowed upon me by my fellow training partners because when I am not in the dojo practicing martial arts physically, I read about the marital arts, A LOT! 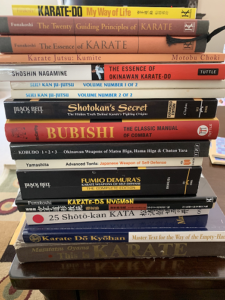 That being said I wanted to open 2019 with a list of all the online resources and books I have read to date and give a quick review of each so that you may investigate them on your own and hopefully further your knowledge of the martial arts so that you too can be a Librarian Sensei! So with that being said, here is the list of my resources to date, in no particular order, with my comments for each. If you are looking for a metric ton of information on practical Karate Bunkai and how to break down Kata then THIS IS THE GUY! I can’t begin to tell you how much I have learned from watching his videos and reading his books. I think I own just about every DVD he has put out and ALL of his books. Anyone that trains with me knows that I mention him often. Jesse refers to himself as a “Karate Nerd” and it shows! This guy knows his stuff. If you want to learn anything and everything about the history of Karate, Japanese and Okinawan culture, Karate practice, etc. his website and YouTube channel are a virtual gold mine of info! No martial arts library would be complete without the works of Gichin Funakoshi. This one as well as the preceeding two are must haves! Great book that Iain Abernethy pointed to via one of his recent posts that explores the kumite methods of Motobu. I am in the process of reading this one currently. Great book on the Shorin Ryu style history and kata however the kata are referenced in this book by pictures only, would have liked to see some explanations as well. These are the books that Soke Don Madden references often during our various training camps and seminars. Definitely a must have for all AKJU members. I believe he still may have copies if you ask him, if not I was able to find mine on Amazon via the link provided. This is the first martial arts book I read. At the time I read this I was just starting my martial arts journey. Now that I have some additional years of training under my belt and additional research I don’t agree with a lot of the kata interpretations in this book. Although it does touch on quite a few of the “myths” prevalent in the martial arts world, I would skip this one and only mention it here for the sake of completeness. Good read if you are interested in the history of the martial arts as well as Chinese medicine and pressure points, this book goes into fairly extensive detail of the later and Patrick McCarthy does an excellent job of covering quite a few historical aspects of the martial arts. Definitely worth a spot in your library. I have not read through this one yet and bought it more for the tonfa katas. I will give a more thorough review of this one at a later date. Also recently purchased and on my reading list for 2019. Stay tuned! Gichin Funakoshi’s introductory text. Well worth the read. Gichin Funakoshi’s master text. There are actually two versions of this out there. The one you can find on Amazon easily here. Which from what I understand has the same written information but has someone other than Gichin Funakoshi performing the movements in the images. And this version here. which I found reference to on Iain Abernethy’s site and has images of Gichin Funakoshi himself in it. The official kata of the WKF. If you are planning to compete in any tournament with USA-NKF or WKF rules, this is the way they are expecting you to perform the kata. Excellent reference guide for Shotokan katas. This is the way I wish Nagamine would have structured his book from a kata perspective. If you are looking for the one book to get you started on better understanding the martial arts and kata then this is the book! Excellent read and well worth its place at the beginning of your library. This book is an excellent one to read with your children and to let them read by themselves. Lots of good info in here on awareness, confidence, etc. Whew! This blog post was longer than I initially expected it to be! If you have stuck it out this far then hopefully you have gathered a list of some resources that will help you as you continue your life long journey through the martial arts. Happy reading and I look forward to training and sharing information with you soon! All Rights Reserved Annarino's Martial Thoughts 2019 | Peaceful by Josip Valtner.